In earlier posts I’ve shared ideas for doing Vacation Bible School creatively and inexpensively. Click here for a review of a curriculum that focuses on clean water and living water. Click here for a post about ways our church has done VBS on a shoestring and a list of some more resources. Here’s an idea for using summer VBS to look more deeply at the Christmas stories. This past Advent, one of our adult Sunday School classes enjoyed Adam Hamilton’s book and five-session dvd study entitled The Journey: Walking the Road to Bethlehem. 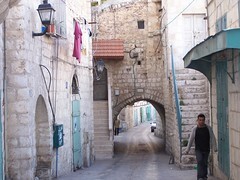 In the dvd Hamilton takes viewers to see Nazareth and Bethlehem and the likely route Mary and Joseph took on their journey. A youth edition and a children’s edition of the study are also available. You can see them all on the Cokesbury website. With all these materials you could plan a VBS for ages four through adult. 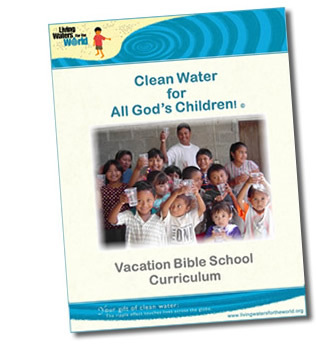 Clean Water for All God’s Children, a VBS curriculum developed by the Synod of Living Waters of the Presbyterian Church (U.S.A.). It connects biblical stories about water and the concept of living water with the wonderful gift of pure water that is critical for life for every living being. Everything you need to plan your VBS is in one manual that costs $47.00. Included are craft patterns, music with a CD, and publicity materials along with the Bible stories and activity ideas. Everything is reproducible. You can view the entire manual online here. Central is a clean water mission project. The Synod of Living Waters sponsors an ongoing mission project called Living Waters for the World, and its aims are to provide clean water systems and training in their use. Clean Water for All God’s Children is flexible and adaptable to churches of all sizes and circumstances. You can order the manual online from the Living Waters for the World site, and many other resources are available there, too.